A stay at Mandarin Hotel Managed by Centre Point places you in the heart of Bangkok, within a 10-minute drive of MBK Center and Lumpini Park. 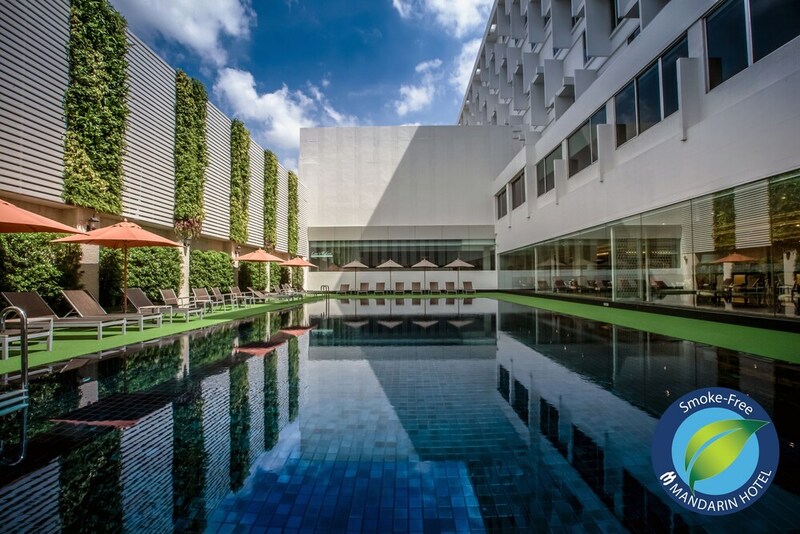 This 4-star hotel is 2.5 mi (4 km) from Siam Center and 2.8 mi (4.5 km) from Pratunam Market. Make yourself at home in one of the 374 guestrooms featuring microwaves and LED televisions. Complimentary wireless Internet access keeps you connected, and satellite programming is available for your entertainment. Private bathrooms with showers feature complimentary toiletries and hair dryers. Conveniences include phones, as well as safes and coffee/tea makers. Pamper yourself with a visit to the spa, which offers massages, body treatments, and facials. You can take advantage of recreational amenities such as an outdoor pool and a fitness center. Additional amenities at this hotel include complimentary wireless Internet access, concierge services, and wedding services. If you'd like to spend the day shopping, you can hop on the complimentary shuttle. Enjoy Thai cuisine at Krua Luang, one of the hotel's 2 restaurants, or stay in and take advantage of the 24-hour room service. Buffet breakfasts are available daily from 6 AM to 10:30 AM for a fee. Featured amenities include a 24-hour business center, complimentary newspapers in the lobby, and dry cleaning/laundry services. Planning an event in Bangkok? This hotel has facilities measuring 15236 square feet (1415 square meters), including a conference center. A roundtrip airport shuttle is provided for a surcharge (available 24 hours), and limited parking is available onsite. In addition to a full-service spa, Mandarin Hotel Managed by Centre Point features an outdoor pool and a fitness center. Dining is available at one of the hotel's 2 restaurants. A 24-hour business center is on site at this 4-star property. A computer station is located on site and wireless Internet access is complimentary. Event facilities measuring 15236 square feet (1415 square meters) include a conference center. This business-friendly hotel also offers tour/ticket assistance, multilingual staff, and concierge services. For a surcharge, a roundtrip airport shuttle (available 24 hours) is offered to guests. Mandarin Hotel Managed by Centre Point is a smoke-free property. Krua Luang - This restaurant specializes in Thai cuisine and serves lunch and dinner. Open daily. Rodjana - This buffet restaurant specializes in Asian cuisine and serves breakfast only. Lets Relax has massage/treatment rooms. Services include facials, body wraps, body scrubs, and body treatments. The spa is equipped with a sauna and a spa tub. A variety of treatment therapies are provided, including aromatherapy. This property offers transfers from the airport (surcharges may apply). Guests must contact the property with arrival details 24 hours prior to arrival, using the contact information on the booking confirmation. No pets and no service animals are allowed at this property. Alcohol is not served at this property.